A three-year-old girl has become the fourth child to die after a house fire which also killed three of her siblings. Lia Pearson was left critically ill after the blaze in Walkden, Salford, on Monday. She died in hospital. Demi, 15, died at the scene on Jackson Street. Her brother and sister, Brandon, eight, and Lacie, seven, died later in hospital. Their mother Michelle, 35, remains under sedation. Posting on Facebook, Sandra Lever, who described Lia as her "beautiful granddaughter", said she "had passed away peacefully". 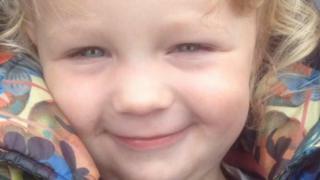 Two people have been charged with the murder of the three older children. Zac Bolland, 23, and Courtney Brierley, 20, both of Worsley, Salford, were also charged with arson and four counts of attempted murder. One of the charges of attempted murder is likely to be changed to murder following Lia's death, Greater Manchester Police said. Mr Bolland and Ms Brierley were remanded in custody when they appeared before magistrates. Any new charges would be heard when they next appear at Manchester Crown Court, police added. Two 16-year-olds - who can not be named for legal reasons - in the house at the time of the blaze which broke out at about 05:00 GMT managed to escape. Greater Manchester Police confirmed there had been incidents at the family's home prior to the blaze and it had referred the case to the Independent Police Complaints Commission (IPCC). Drew Povey, head teacher at Harrop Fold School, Worsley, which Demi attended, paid tribute to the popular pupil. He said she was a "really good kid… fun-loving… and funny". "Inside school [her] friendship group was enormous. "I don't know anyone that didn't really get on well with her… and it was the same outside of school as well," he added.